Amazing, awesome, stunning – what else can I say. Looking at the stalagmites and stalactites you think – I could easily have walked through here. Everything is so clear. You cannot see water. You don’t experience water except when you get used to the water temperature. Diving in a cenote is an exclusive adventure. A Cenote is essentially a sinkhole or a natural pit. This is the result from the collapse of limestone bedrock that exposes groundwater underneath. Cenotes were often used by the ancient Maya for sacrificial offerings. In the Yucatan Peninsula of Mexico there are more than 6000 cenotes. Arriving from Cancún, we checked in to Villas Picalu Hotel Boutique in Puerto Aventuras. 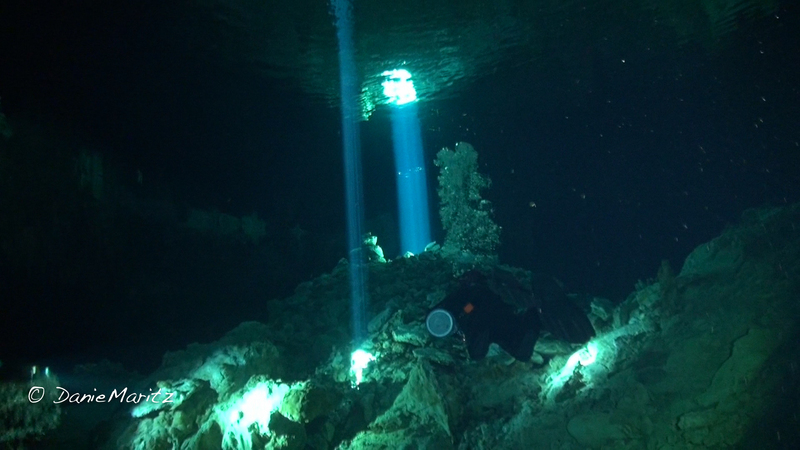 Javier and Marco from Yucatan Dive Trek will introduce us to the best Cenotes in the state of Quintana Roo during the next four and a half days. Dos Ojos meaning two eyes in Spanish, will be our introduction to Cenotes diving. It is one of the largest underwater cave systems. It is named Dos Ojos because of the two sinkholes, approximately 70 m in diameter connected by a 400 m long passageway. There are lots of natural light and the visibility through the water is just amazing. The water temperature is 25 degrees Celsius and a favourite with snorkelers and divers. The one side is named the Barbie line. Following the Barbie Line you will see beautiful columns and enormous stalagmites and stalactites. Casa Cenote was the first cenote of the next day. Situated close to the beach, the water was absolutely crystal clear. In some parts you could see small fish amongst the mangrove roots that reached down in the water. A school of good-sized tarpon was around too. It is a popular snorkel place and you can rent kayaks. The water was a good 26 degrees Celsius. From here we arrived at El Pit. The entrance is steep. Equipment is lowered down by pulleys.You descend through a shallow halocline and arrive at the hydrogen sulphide cloud at 27 m where a few tree branches take shape in the cloud. The cave overhang is worth exploring. You can see the entrance and its surrounding trees and a sheer wall of light tinted a slight blue colour. Divers near the surface look like flies. At 10 m the ceiling starts sloping up. Not only will you experience beautiful decorated formations but the laser beams of sunlight penetrating the clear water are a glorious sight. The Halocline layer at 12 m is where the salt and freshwater layers come together. Ponderosa, also known as Garden of Eden, is a large open cenote with crystal clear water and large blocks of collapsed, algae covered limestone. The entrance is huge. When you reach the start of the permanent cavern line you will be able to clearly see light ahead. This is Cenote Corral, 90 m away. When you reach Cenote Corral, you have an incredible view of the jungle above and the cavern below. The light show once again is brilliant. At the far end of the cavern zone, you will encounter a strong halocline as well as a wispy layer of hydrogen sulphide. TajMa Ha is one of the most beautiful cenotes. It is decorated with stalactites, stalagmites and plenty of hidden fossils. The dive will lead you past three caverns with impressive light effects. No matter what time of the year you visit, the “Points of Light Room” have to be seen to be believed. TajMa Ha really reminds one of the beauty and splendour of the Taj Mahal in India. Cenote Kukulkan and Chac Mool are the flavours of this sunny fourth day. Access to Kukulkan is through a beautiful pond. A huge cavern surrounds the cenote. The light effects are amazing. Unfortunately NO cameras allowed. A concession was given to a company to take a photo of you in the cenote. Looking towards the ceiling at the entrance you can see colours of the rainbow. No light memories. How sad! Chac Mool has two water entries leading into the same large room with much light entering. In the second room a part of the ceiling collapsed. Divers can surface here to admire two levels of beautiful stalactites. Along the main entrance opening, trunks and branches reach into the water setting the scene for a stunning laser light show. A halocline, that is where salt and fresh water come together, creates fascinating visual displays. Once again NO cameras – a real pity. Today is our last day of cenote diving. 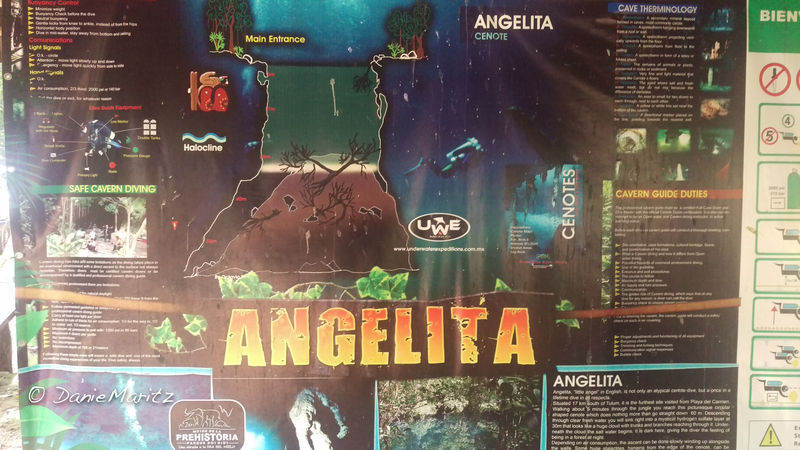 Cenote Angelita, Little Angel, is our first stop. It is not only the furthest visited site from Tulum with a picturesque circular shape but also an once in a lifetime dive in all aspects. We descend through clear fresh water stopping just above the mystical hydrogen sulphate layer at 30 m. It looks like a huge cloud with trunks and branches reaching through it. It is alleged that entering this layer with your camera might have a bad effect on the housing. We gave the cameras to one of our guides and slipped into the “darkness of the forest” out of sight. Beautiful and eerie. How amazing was the four and a half days. Each and every day was absolutely satisfying, surreal and awesome. Thank you Yucatan Dive Trek for an experience of a lifetime.